A very wise man (aka my best friend Matt) said that you cannot live your best life without guacamole. And I’m 100% on board with that. 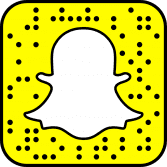 But also you really can’t live your best life without salsa, cheese and fajitas so in honor of that…. 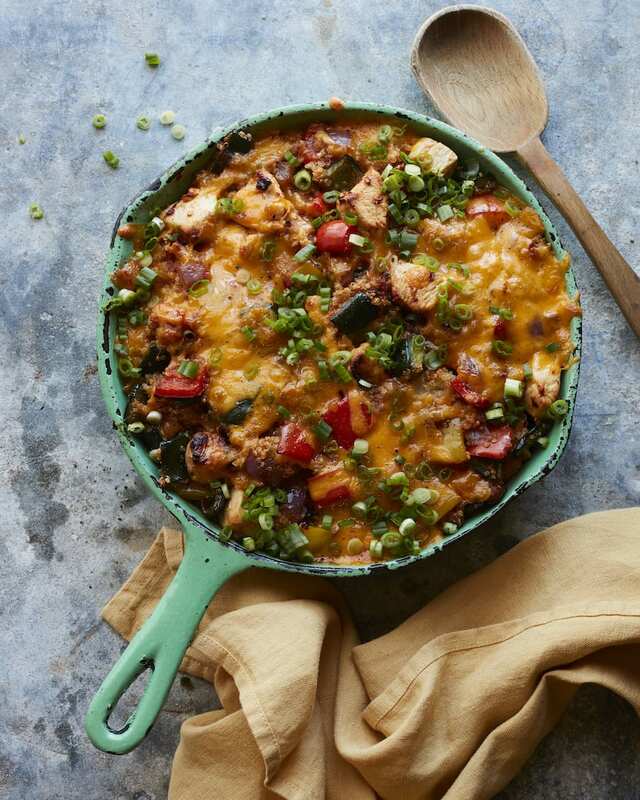 let’s make a Chicken Fajita Skillet Quinoa Bake! You guys know how much I love eating out of a bowl right? I mean I wrote an entire chapter on bowls in my cookbook for crying out loud! I have similar feelings about cooking everything in a big ‘ol skillet and serving it straight outta the pan. 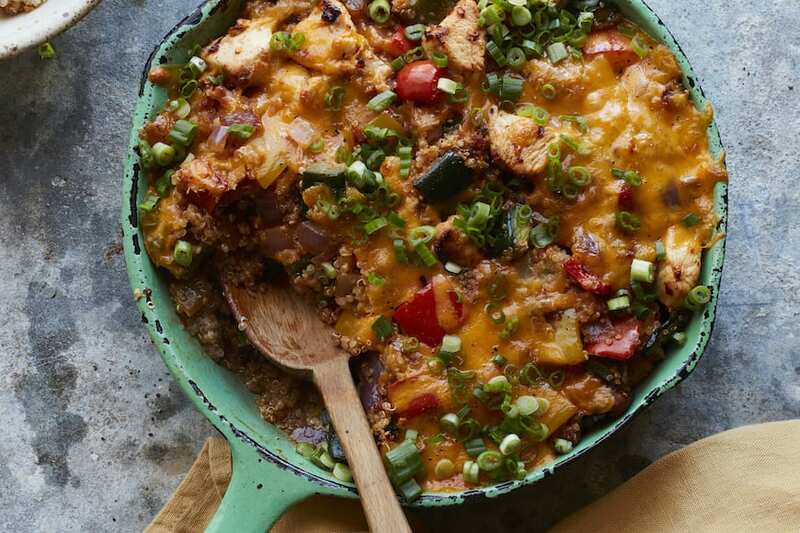 It makes things easy and that’s exactly what this Chicken Fajita Skillet Quinoa Bake is! 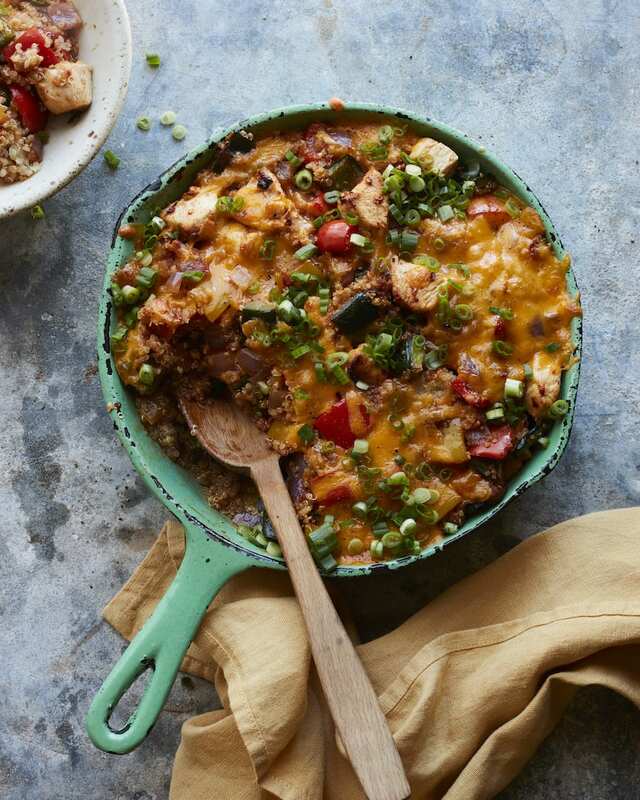 It’s everything you love about fajitas, mixed with some quinoa (you could also use rice or pasta if that’s more your jam), doused with salsa (I might suggest one of these chipotle salsa, tomatillo salsa, or guacamole starter), topped with plenty of cheese and then baked to perfection. It’s PERFECT for any weeknight meal and it’s incredible as leftovers! Top it with some guacamole and call it a day! Slice the chicken breasts into cubes, about 1 inch. Combine the lime juice, olive oil, garlic, salt, cumin, chili powder and red pepper flakes in a bowl and whisk to combine. Add the chicken and marinate for 1 hour. Heat a large cast iron skillet over high heat. Add a tablespoon of olive oil. Add the chicken mixture, marinade included, and sauté until fully cooked. Using a pair of tongs, remove the chicken from the skillet and add the vegetables. Sauté until tender and charred. Add the chicken back into the cast iron skillet and toss to combine. Remove from heat and set aside. Meanwhile, preheat the oven to 375 degrees F. Cook the quinoa according to the package directions. Once cooked, remove from heat and transfer the cooked quinoa into a large bowl. Fold in the chicken fajita mixture, 1 ½ cups of the shredded cheese, and salsa. Season the entire mixture with salt and pepper and stir to combine. Lightly spray a large skillet with non-stick spray, and transfer the mixture into the baking dish. Top with the remaining shredded cheese and bake for about 20 minutes until the top layer of cheese is bubbly and melted. Remove the baking dish from the oven and garnish with green onions and serve. What a tasty quinoa bake! I love that quinoa cooked with salsa! This is going to be my new go to meal! 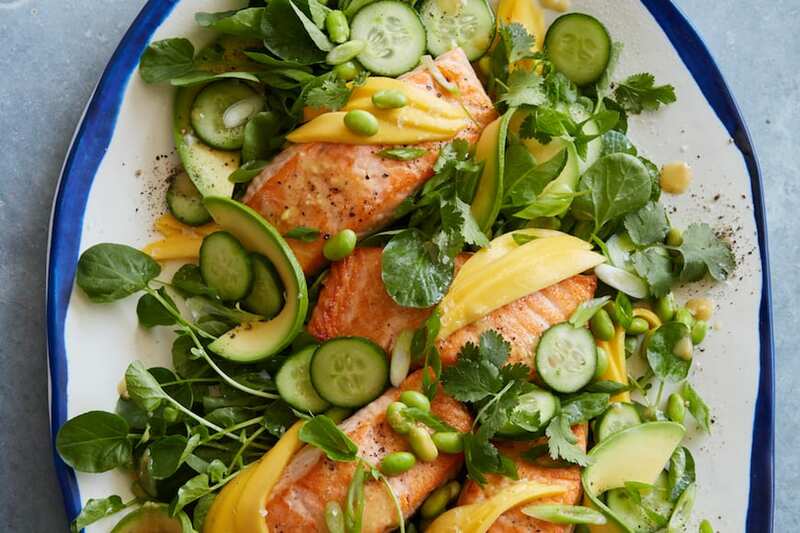 Your love of life is reflected in all of your bright flavorful fun recipes. I have had a lot of enjoyment from trying your recipes and the compliments I have received from serving them to my family. I LOVE a one pot meal and this one looks SOOOOO good! 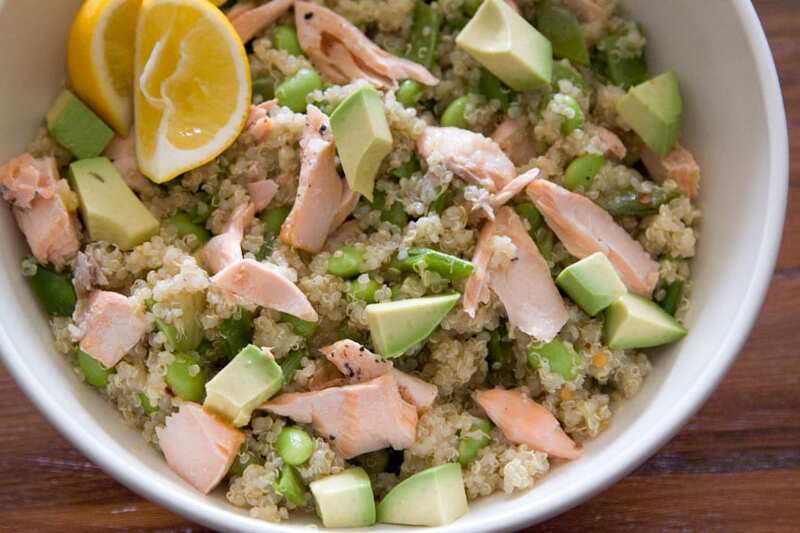 I love this use of quinoa. So Smart! GET IN MY BELLAY! This looks absolutely AMAZING, and even better, it’s something my entire family will eat and enjoy! Pinned! This was delicious! The only change I made was that I used a can of fire roasted tomatoes because I didn’t have any salsa and threw in some frozen corn. Will be making this one again! This is going to be my new favorite meal!! Goodness in a bowl!! This is so delicious, I added 1/2 c frozen corn after reading the comments. This combo with the poblano, red onion, salsa is YUMMY! Thanks Gaby, keep it coming with these mind blowing recipes! 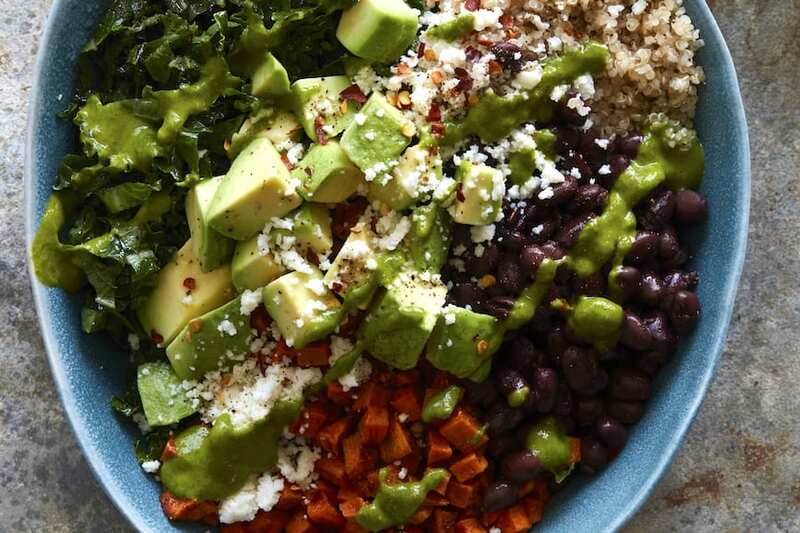 Do you think I could use rice instead of quinoa? Maybe a medium/long grain? We tried this last night and it was DELICIOUS. We added another bell pepper for extra veggies and color. Already trying to figure out when we can make it again! Thanks Gaby!